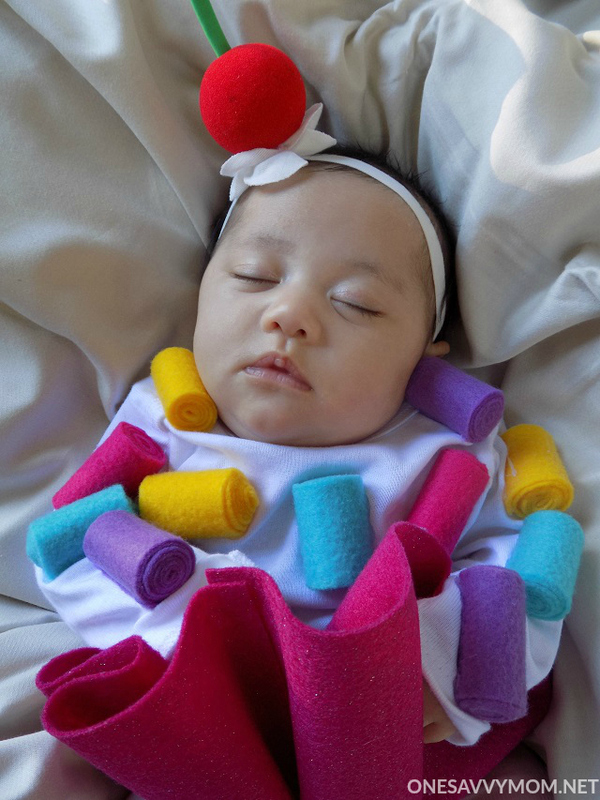 Looking for an adorable DIY costume idea for baby's first Halloween? This super simple DIY Baby Cupcake costume is it! I grabbed most of what I needed to make it, on a recent essentials run to Babies "R" Us,. The best part about this DIY cupcake costume? Only the soft cotton from the long sleeve bodysuit used to make it, will touch baby's sensitive skin! Halloween will be baby Charlotte's first big holiday, and the kids couldn't be any more excited. They've been brainstorming for weeks about their own costumes and costume ideas for the baby. Baby costumes (and costumes in general) are mostly comprised of synthetic fabrics and stuffing though, and that can be harsh on a newborns sensitive skin. Obviously, I wanted to avoid that! So after much discussion, we finally landed on this DIY cupcake costume idea. I love how it turned out! Isn't it cute? It was so simple to assemble too, and I love that it doesn't irritate her sensitive skin. Having been to this rodeo a few times now, trust me when I say this moms; a screaming crying, itchy baby - doesn't make for a fun holiday experience! So definitely keep baby's sensitive skin in mind when brainstorming costume ideas. Check out my super simple tutorial on how you can assemble your own No-Sew DIY Baby Cupcake Costume this Halloween, below. Cut your felt (in assorted colors) into 2 1/2 " x 10" strips . You will need 4-5 strips in each color (20-25 strips total). 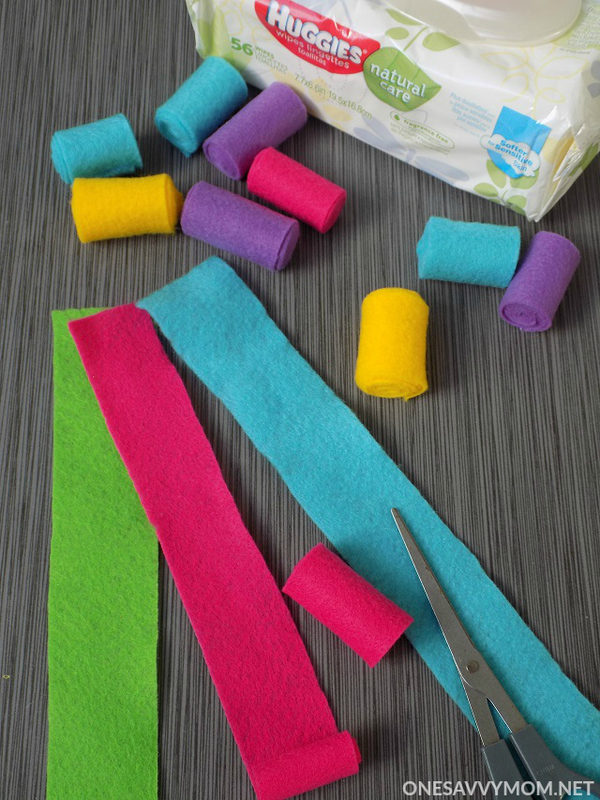 To create the rainbow sprinkles for the costume, start with one of the pre-cut felt strips. Pinch felt tightly at one end and roll lengthwise (make sure to roll tightly). Secure with a few dots of hot glue at end (refer to images above and below). Repeat this step until you have completed 20-25 "rainbow sprinkles" for your cupcake costume. Set your completed sprinkles to the side. Next, grab the two pieces of glitter felt (in your choice of color - I used pink) and a needle and thread, to create the "cupcake wrapper' for your cupcake costume. Lay your glitter felt pieces side by side. Join them together in the center with a small amount of hot glue. Next "tack" the felt to the cotton body suit (at the seam on either side of the front) using 4-5 quick stitches. Once your felt "wrapper" has been secured on either side to the front of the cotton body suit, now its time to create the cinching that will make it actually look like a cupcake wrapper. 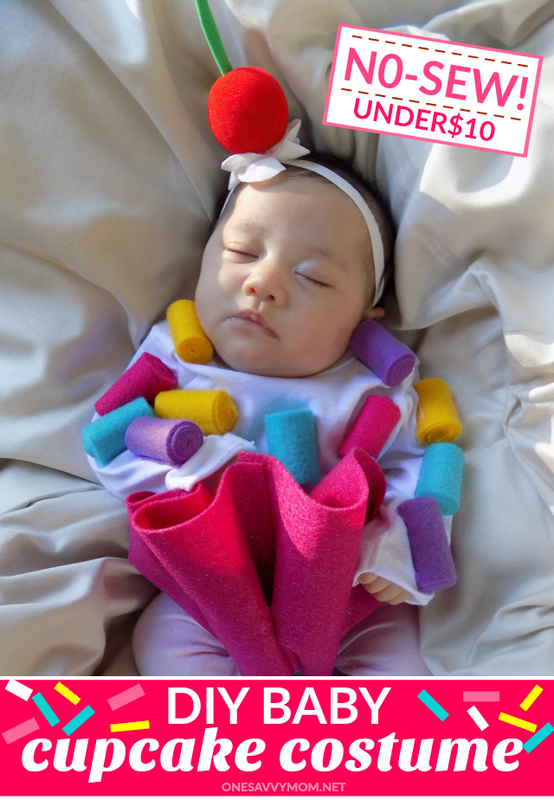 Once your cupcake "wrapper" is complete, now it's time to affix your completed rainbow felt "sprinkles" to the front of the cotton body suit. 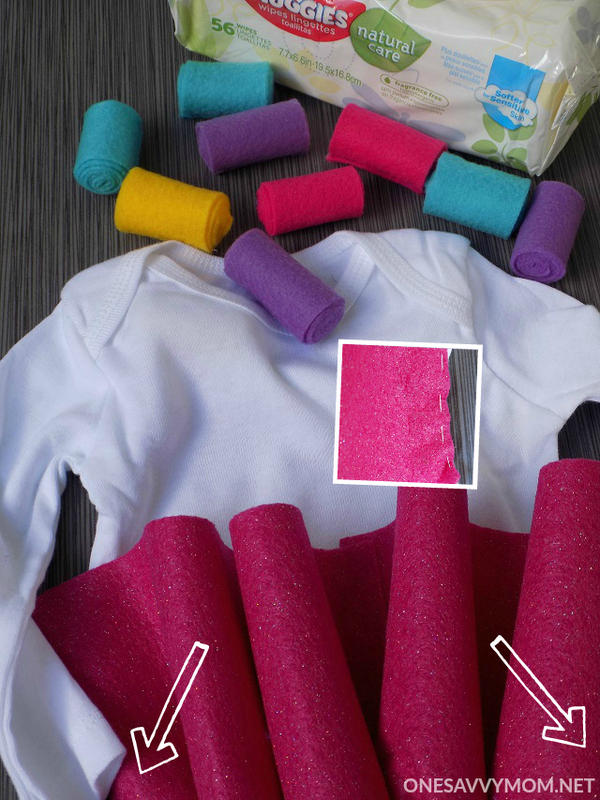 Start by adding 2-3 generously sized dots of hot glue to the back of a felt "sprinkle" Press and hold the felt sprinkle to the front of the cotton body suit for a minute or two, until the glue has cooled. Repeat this step, adding your sprinkles in a random pattern above the "cupcake wrapper," until all of your sprinkles have been secured in place. NOTE: Work your hand under the areas where you are affixing each of the sprinkles as you go, OR slide a piece of scrap cardboard inside the cotton body suit (to keep the body suit from being glued together during this step). 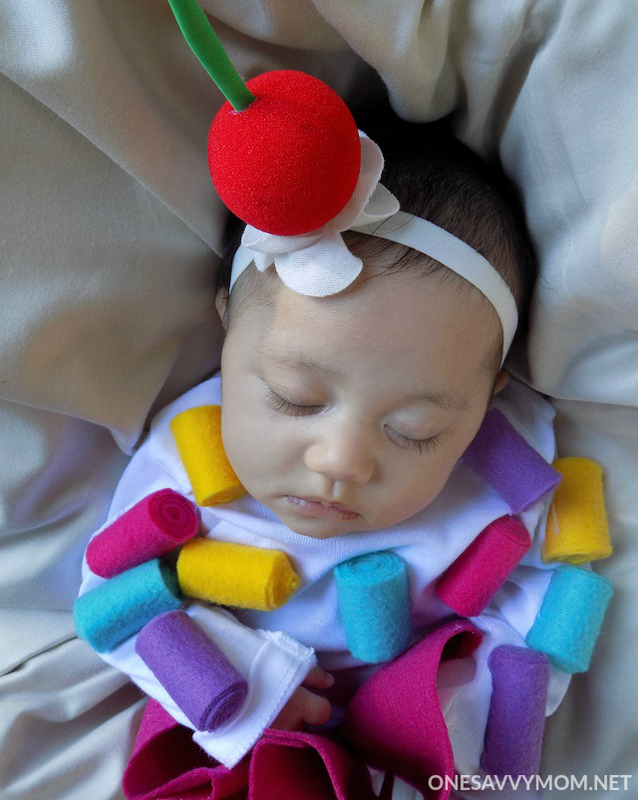 The last step in creating this no-sew DIY Baby Cupcake Costume, is to create the "cherry" headband for the top of your "cupcake"! Start by cutting a 4" L x 1" W piece of green craft foam. Roll it tightly, and add a few dots of hot glue to secure it in place (in the shape of a straw). Now, squeeze a few dots of hot glue down into the hole of the foam clown nose. Then push your green foam "cherry stem" down inside the hole. Squeeze the foam clown nose lightly until the glue has cooled. Once the glue has dried, and your "cherry" is assembled, add a generous sized dot of hot glue to the top of the cotton baby headband. Press the underside of the cherry to the glue and hold it in place until the glue has cooled. Refer to image below to see how the assembled "cherry" topper headband should look, once complete. Now, your no-sew baby cupcake costume is complete and trick-or-treat ready, for baby's first Halloween! This costume is so cute, and it's perfect for baby's sensitive skin. Like most moms, I'm always concerned about keeping my baby's sensitive skin safe. 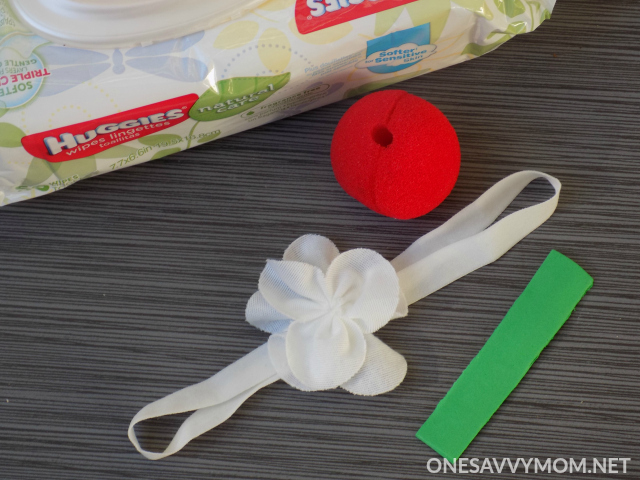 One way that I'm able to do that everyday, is with Huggies Natural Care wipes. They are so thick and cottony soft, and they're specially formulated [hypoallergenic] for sensitive skin. They're the best! Friends, being a "4th time mom" definitely has its perks. This time around I know exactly what NOT to buy (like scratchy Halloween costumes) and just what my baby needs (like super soft homemade cotton costumes and Huggies Natural Care wipes). 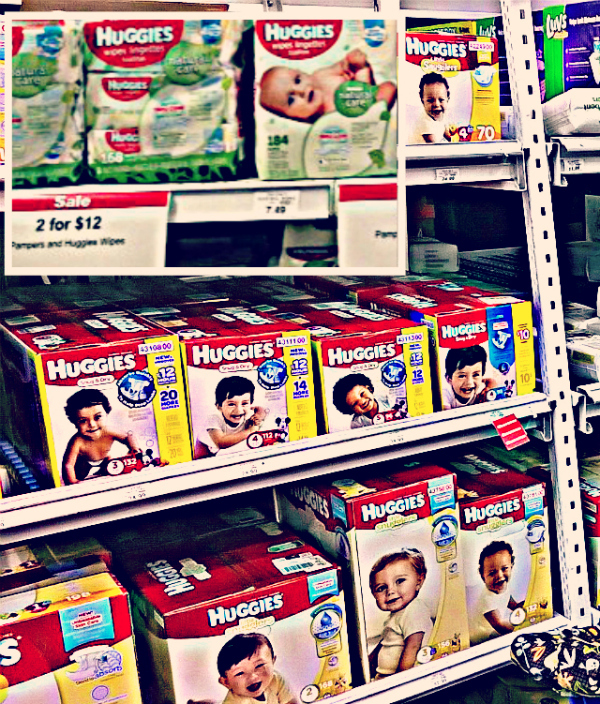 I grabbed most of what I needed for my DIY Baby Cupcake costume (a 3 pack of white cotton body suits and a 3 pack of baby cotton headbands), while I was stocking up on Huggies Natural Care Wipes and Huggies Little Snugglers diapers, at Babies "R" Us. Do you have a little one that is also celebrating their first Halloween? Celebrate Baby's First Halloween at a fun in-store event at your local Babies "R" Us, on 10/15/16, from 11am-12pm! The event will feature a fun keepsake craft and parade around the store. Experts will also be on-hand to help moms get ready for colder weather; highlighting helpful product solutions and tips. It's also a great way to meet and mingle with local moms. They'll even have fun giveaways and raffle prizes for attendees! Click HERE to find out more, and to see other upcoming Babies "R" Us events. Have you ever made a cute DIY Halloween costume for your little one? I'd love it if you'd share your ideas in a comment below! Motherhood definitely requires a little creativity sometimes! Grab MORE creative ideas and baby tips HERE . I hope you all have a memorable happy Halloween! Thank you ~ I think it's my favorite part too:) I hope you have a Happy and memorable Halloween with your little ones! This is just too cute! The cherry headband is adorable! Awe, thank you :) It was fun to make! Happy Halloween! What a really great idea! I love that there is no sewing involved. Love the cherry headband. Oh my gosh, that is so adorable! I love how easy it is to make too! What a GREAT idea!!! Thank you! :) so quick & simple to make! Happy Halloween! this is so cute and perfect if your trying to save money on Halloween costumes! and sooo much cuteness! :) Happy Halloween!